As imagined by AMC's writers, and vividly brought to life by Kevin Guthrie, Harry Peglar is a pensive, thoughtful, reflective man. 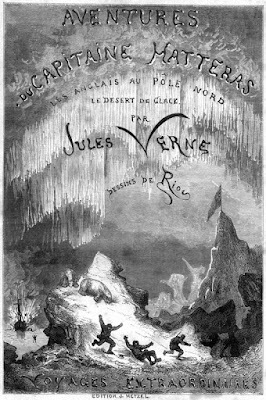 Under the mentorship of subordinate officers' steward John Bridgens (John Lynch), who feeds him books from Shakespeare to Herodotus, he evolves into one of the key figures of the story, particularly as it reaches its later stages. It's no accident that the episode titles of two of the last three installments -- "The Terror Camp Clear" and "The C, the C, the open C!" are both lines taken from the mysterious "Peglar Papers," of which he was the presumed author, and which constitute the sole surviving written record -- aside from the "Victory Point Note" -- yet recovered from the expedition. So who was Peglar, in real life? Who was Bridgens? How much did the show's writers draw from his writings, and what can we learn from these cryptic, mostly backwards-written papers? Thanks to the work of pioneering Franklin scholars Richard Cyriax and A.G.E. Jones, we know a bit more about Peglar than the other regular seamen aboard Franklin's ships. Harry Peglar was born in either 1811 or 1812; his father was a gunsmith with a shop at 12 Buckingham Row, Petty France (later Victoria Street), Westminster. As Jones observes, and as we can see on this detail from Stanford's Library Map of London, the Blue Coat (now Blewcoat) School was quite nearby, and Peglar might possibly have attended (the building still stands, though now used as a fashionware shop. Like other similar charity schools, it would have provided young Harry with the sort of rudimentary education that was, at the time, thought all that poor children needed, or could use. This modest training was supplemented when Peglar entered the Marine Society, which prepared young men for navy or merchant service; on his entry in 1825, he was noted as being able to both read and write. He was only there a month before being dispatched to the Solebay training station for his final practical training, after which he was issued a set of sea-going clothes, along with needles and thread, a canvas bag, a prayer book, and a copy of the Reverend Sellar's Abridgement of the Bible (one can imagine that his tendency to quote or paraphrase passages from these books must have had its roots here). His career at sea was an extensive one; before joining the "Terror" he'd served aboard more than a dozen ships, from the Clio in 1825 to the Temeraire in 1844, on voyages to China, Singapore, Bombay, and the West Indies. His conduct was generally noted as satisfactory, though he did earn one indication of unsatisfactory while aboard the Marquis Camden in 1833, where he was cited for drunkenness and mutinous conduct -- for which he was given two dozen lashes and disrated to an ordinary seaman. The lesson apparently took, though, as his conduct was good for the rest of his career, and he re-ascended the ranks, coming aboard Terror as "Captain of the Foretop" -- quite a senior grade. As his papers testify, though, his literacy in writing was somewhat wanting; he tended to spell phonetically (Jamaker for Jamaica, wissel for whistle, and sitty for city). It would seem unlikely that he was very widely read, as one would think that would have influenced his spelling habits, and a volume of Herodotus would seem quite a challenge! But the relationship with Bridgens (who was in fact more than a decade his junior) is the show's way of representing the fact that Peglar's infamous papers were found in the jacket pocket of a corpse on King William Island, that of a man who, when living, tied his neckerchief in a steward's knot, and wore a coat with cloth-covered buttons -- telltale signs of his shipboard status as a steward. Two candidates have been proposed for this person from among the crew of the Terror: William Armitage, the gun-room steward, and William Gibson, the subordinate officers' steward (the same rank as Bridgens on Erebus). Both had served with Peglar before, giving ground for the presumption that the dead steward was, as a friend, hoping to carry Peglar's papers home (he in this theory being deceased). Recent work by Glenn M. Stein seems to indicate that Armitage was illiterate, whereas Gibson was not -- which could be a key detail. His paper "Scattered Memories and Frozen Bones: Revealing a Sailor of the Franklin Expedition, 1845-48" is available free from my website as a .pdf. As to the papers themselves, they are their own special enigma; I've been quoted as referring to them as the "Dead Sea Scrolls of the North." Not only are nearly all of them written backwards, but they contain almost nothing relating to the Franklin expedution, with the exception of a blank page headed "lines writ in the Arctic" and the enigmatic "the Terror Camp Clear" (or, I should say, Eht Rerrot Pmac Raelc!) I've spent more than twenty years working to decipher them, with some success, following in the footsteps of Cyriax and Jones. Those who wish to go down the rabbit hole -- you've been warned -- may read my most recent analysis, which appeared a few years ago in the Trafalgar Chronicle. 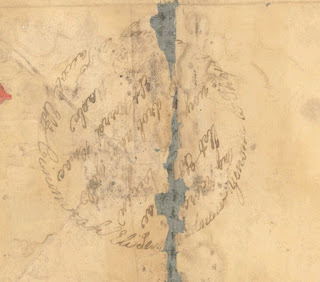 You can also search this blog for earlier posts about Peglar -- no stone has been left unturned -- I've even identified the torn newspaper clipping with which his wallet (see above) was lined -- but the enigma remains. A "deed of gift" -- and a gift indeed! It's been a long time in the making -- roughly twenty years or so -- but the two ships that sailed as Sir John Franklin's last, lost expedition -- HMS Erebus and HMS Terror -- have now been officially given to the people of Canada by the government of the United Kingdom. It all began in 1997. That was the year that Canada and the UK signed their first "memorandum of understanding," which stated their mutual agreement that Franklin's ships, if found, would be given to Canada, with the exception of three things: Gold (not bloody likely), the bodies of the dead (to be repatriated if practical), and objects deemed "to be of outstanding significance to the history of the Royal Navy." It was a hypothetical division of the spoils, to be sure -- neither ship had yet been found -- and it predates the era when the Harper government made finding these ships such a priority. The main force behind it, I would say, was the increasing realization -- particularly in light of the dramatic exhumations of the Franklin soilors' bodies at Beechey Island by Owen Beattie in 1984 and 1986, as well as the excavations at Erebus Bay undertaken by Anne Keenleyside and Margaret Bertulli -- that the Franklin story, among the many other things it was, was increasingly, distinctively, a Canadian story. With the discovery of the ships themselves in 2014 and 2016, though, the plot thickened. The precise meaning of the MOU, and the definition of "outstanding significance" raised a host of issues that now appeared as obstacles. 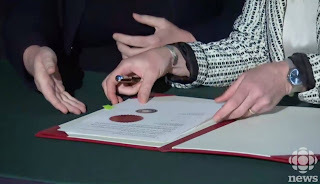 And so, although Britain's then-defense minister Sir Michael Fallon announced late in 2017 that the ships were indeed to be given to Canada, this was followed by a very long pause, as negotiators met over weeks, and then months, to hammer out the details of how this transfer would be made. Enter Canada's new Environment minister, Catherine McKenna, along with Susan le Jeune d'Allegeershecque, the High Commissioner to Canada. At today's press conference, the implication seemed to be that they had, together, brokered an end to the logjam of back-and-forth negotations, and indeed it seems that they have, as they signed the formal "deed of gift" for the two vessels. Those who remembered the history of the earlier agreement were led, of course, to wonder when it was mentioned that the items of "special significance" had been deemed to be the 65 items already brought back from HMS Erebus by Parks Canada's underwater aracheologists, many of which are part of the current exhibition at the Canadian Museum of History, which hosted the signing news conference. It's a peculiar solution to a peculiar problem. On the one hand, it seems a sad and sudden loss to surrender these 65 items, which were removed from the wreck of the Erebus and conserved in laboratories in Canada at considerable expense. On the other, it is certainly the case that the remaining artifacts -- which will likely include written materials -- will eventually number many times that figure. I was initially a bit upset at the idea, but it's grown on me as I've thought on those things which are yet to come. The other major takeaway from the press conference is that the Inuit Heritage Trust have given their blessing to this settlement, and that their ongoing co-operation and co-ownership of artifacts with Parks Canada is secure. The IHT spokesman, Torsten Diesel, spoke of the invaluable contributions of the late Louie Kamookak (in whose memory a moment of silence was observed) along with Sammy Kogvik, and the older Inuit testimony that have all been vital to the finding of the ships. He and the Trust hope -- and it's a hope I share -- that this will add momentum to their efforts to raise funds for a proper Archives of Nunavut, which would be able to conserve and house future findings, along with all the vast collection of materials currently held in trust for the GN at various museums and archives. The ultimate point of all this complex history, though, is a simple one. With legal issues such as ownership and management cleared up, and with the dedicated support of their new research vessel the David Thompson, Mark-André Bernier and his Parks Canada team will finally be able to proceed with their work free from the many complications these matters created when unresolved. I'm very happy for them, and looking forward enormously to the finds of this year, and many years to come. Due in large part to his icily brilliant portrayal by Alistair Petrie in AMC's current series "The Terror," Stephen Samuel Stanley has moved into sudden prominence among Franklin's officers and men. 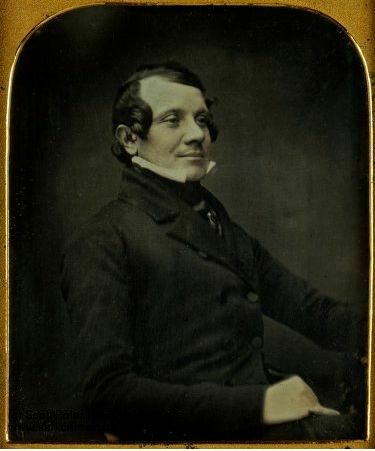 Petrie seems to have picked up on a certain hint of haughtiness, which seems to me evident in his Daguerreotype: he is posed at his ease, face at a perfect 3/4 angle, with just the slightest hint of a smile -- doubtless one of self-satisfaction. In the series, Petrie expands this into a consistently arch, aloof, private man, who repeatedly emphasizes that Mr. Goodsir is not a doctor, while he is "Doctor Stanley." But who was he in real life? Was he in fact a doctor of medicine? And who is the mysterious "daughter" alluded to in one episode (she appears in a drawing in his journal), the one who may (or may not) love birds? Stephen Samuel Stanley qualified and entered the Navy as an assistant surgeon on June 5th, 1838. There were a number of ways he could have qualified for this post -- a degree in medicine was not required, -- although there is a record indicating he studied for a time under Sir William Fergusson, at the time Britain's leading anatomist and later sergeant-surgeon to HM the Queen. As with many of the other younger officers, Stanley first saw active duty in the China War of 1842, aboard HMS Cornwallis. The Cornwallis, a 74-gun third rater, saw considerable action, and was selected as the site for the Treaty of Nanking to be signed. 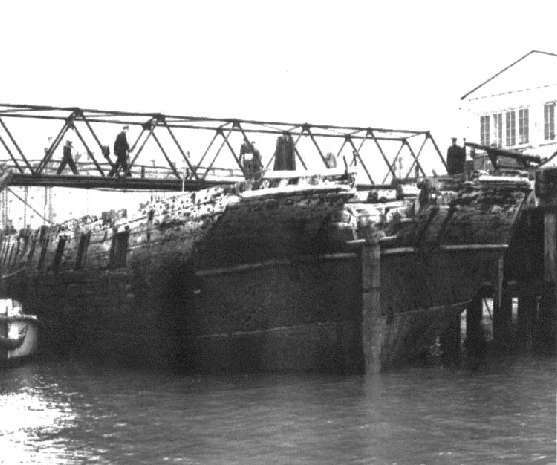 Remarkably, although built in 1813 (the same year as HMS Terror), the Cornwallis was converted to a jetty and survived until 1957, when she was broken up at Sheerness. As to Stanley himself, the record is less clear. Although it's not often mentioned -- and wasn't apparently known to some of his brother officers -- he was married, and had at least one (step) child, a son, Samuel Leopold Stanley, who died in 1861 at the age of 27 in Hastings. This would have made him a lad of eleven when the Franklin expedition sailed. Curiously, the record shows that our Stephen married Mary Ann Windus on May 10th, 1845 -- this would have been scarcely ten days before the ships sailed! This raises the possibility that the son was Mary's from a previous marriage -- and yet, for whatever reason, Stanley did not alter his will of 1839, which made no mention of, or provisions for, any family. Mary Ann died in 1873 at the age of 67, and was mentioned in her notices as Stanley's widow; although the AMC series makes reference to a daughter, there is no record of any other children. A genealogist of the Windus family, who has done a good deal of digging into the matter, believes that the son was in fact Mary Ann's, born as Samuel Leopold Speight -- Speight being the name of her first husband, Samuel Speight, from whom she'd separated after he was declared a bankrupt in 1835. It's a tangled web, indeed. "He was in the Cornwallis a short time, where he worked very hard in his vocation. Is rather inclined to be good-looking, but is fat or flabby as if from drinking beer, with jet-black hair, very white hands (which are always abominably clean), and the shirt sleeves tucked up; giving one unpleasant ideas that he would not mind cutting one's leg off immediately -- 'if not sooner.' He is thoroughly good-natured and obliging, and very attentive to our mess." "Stanley is a would-be great man who as I first supposed would not make any effort at work after a time. He is at present however altho he knows nothing whatever about his subject & is ignorant enough of all other subjects showing it more than any other person I ever met with in consequence of his speaking so much." There is only one other, enigmatic clue as to the fate of Stanley. On Montreal Island, a search expedition led by James Anderson found two small pieces of wood; on one was scratched "Erebus" and on the other "Mr Stanley." Thinking back to his character as played by Petrie, one may well wince at this final demotion to "Mr." -- and wonder if, just perhaps, the wood was a little singed around the edges. In next week's episode five of AMC's "The Terror," Captain Crozier, seeing Henry Collins approach with a party from "Erebus," quips "Ah, Mr. Collins! How fares the Raft of the Medusa?" 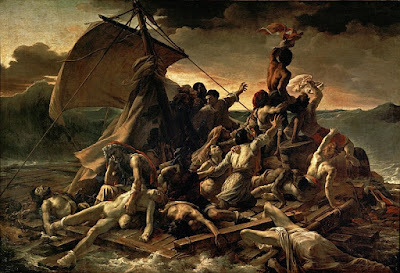 Given the ships' already hellish names, the reference might slip by some -- or perhaps seem simply an allusion to the crowded conditions aboard ship -- but in 1847, a far darker meaning would have been obvious to anyone, as Théodore Géricault's infamous painting of that name had become a byword for cannibalism. The painting was based on the wreck of the French frigate Méduse, which sank in July of 1816; what followed was one of the most harrowing shipwreck stories of all time. A raft, made of parts of timber from the ship, was crowded with nearly a hundred and fifty people; over the next two weeks, all would perish but fifteen of them. Dehyrdration (some drank sea-water and died even more painfully), starvation, and drowning took many, and in their final desperation, cannibalism was resorted to by the survivors. The painting itself stirred its own controversy; Géricault consigned it to a somewhat unscrupulous art-dealer, who took it on a one-painting tour of Europe that was condemned for making money off an image of disaster. At one of its appearances, in Dublin Ireland, it was upstaged by a moving panorama of the same subject, which had the added attraction of being personally narrated by one of the survivors! 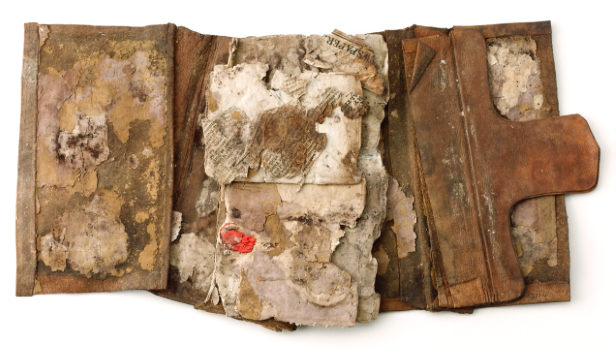 It's a fairly well-known story today how Dr. John Rae, along with the almost-sacred relics of Franklin and his men, brought back Inuit testimony that some of them has resorted to what he called "the last resource." The Inuit told of boots containing cooked flesh, bones broken open for the marrow, and piles of skulls. On arrival in England, Rae's testimony proved explosive; he had intended it only for his private report to the Admiralty, but it ended up on the pages of The Times. He received the £10,000 reward for ascertaining the fate of Franklin, but was shunned by Lady Franklin and many other Arctic hands. 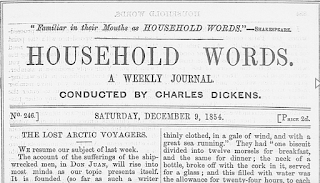 His toughest opponent turned out to be Charles Dickens, who -- after the seeming-kindness of offering to print Rae's full report in his magazine Household Words -- launched into a two-part tirade, "The Lost Arctic Voyagers," in which he argued that no good Christian navy man would resort to such behavior, and that hostile Inuit were to blame. Thanks to the careful forensic work of Anne Keenleyside, we now have clear evidence that Dickens was wrong, and that the Inuit testimony was, as it has again and again proven to be, truthful. 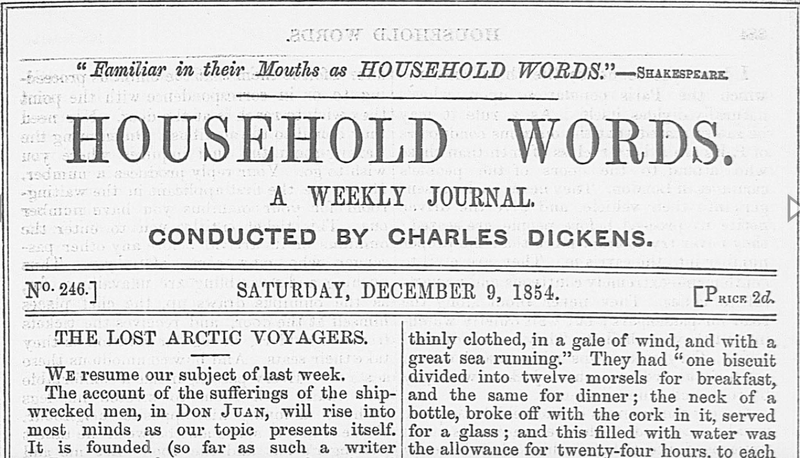 Dickens, as it happens, had been obsessed with the subject of cannibalism since he was a boy. Working in a boot blacking factory, he managed to set aside a penny a week for a subscription to a lurid magazine calling itself The Terrific Register. 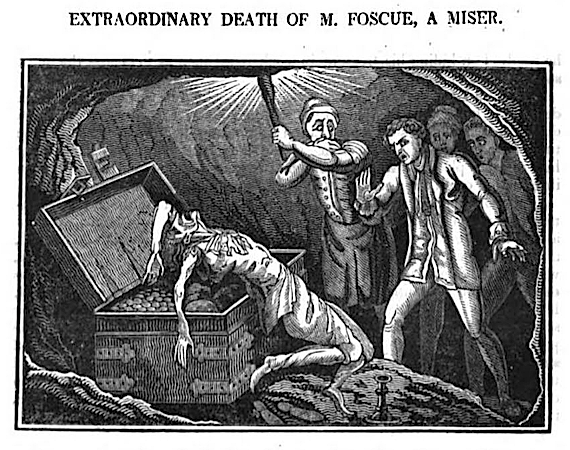 To his friend John Foster, Dickens quipped that for a mere penny, the magazine frighened the wits out of his head, "which, considering that there was an illustration to every number in which there was always a pool of blood, and at least one body, was cheap." 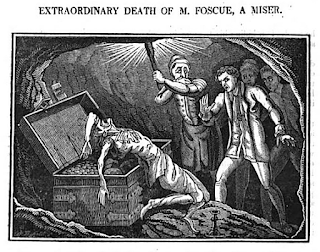 Among these was the case of a miser, Mr. Foscue, who was so fond of his money that he had himself locked in his own bank vault; some time later, he was found dead, having endeavored to sustain himself by eating his own flesh, fork in hand. Some Dickens scholars feel this story planted the seeds of the character of Ebenezer Scrooge! No discipline worthy of the name had been observed aboard the Medusa from the minute of her weighing anchor. The captain had inexplicably delegated his authority "to a man who did not belong to the staff. He was an ex-officer of the marines, who had just left an English prison, where he had been for ten years." This man held the ship's course against the protest of the officers, who warned him what would come of it. The work of the ship had been so ill done, that even the common manoeuvres necessary to the saving of a boy who fell overboard, had been bungled, and the boy had been needlessly lost. Important signals had been received from one of the ships in company, and neither answered nor reported to the captain. The Medusa had been set afire through negligence. When she struck, desertion of duty, mean evasion, and fierce recrimination, wasted the precious moments. "It is probable that if one of the first officers set the example, order would have been restored; but every one was left to himself." All this, of course, was brought home by Dickens's intense admiration for Franklin and his officers and crew. Franklin's presence alone, he reasoned, rendered such a thing impossible (he apparently forgot that cannibalism also occurred on Franklin's first land expedition -- and did not know that Franklin had died the year before the ships were abandoned, as this was only learned in 1859). Naval discipline, the good character and cheer of the men, and their essential Englishness formed the rest of the guarantee. The (other) books behind "The Terror"
In browsing my Twitter feed about AMC's new series "The Terror," I was a little surprised to see a --possibly mock -- complaint hurling an obscenity at any show that starts by "making me read." Fair enough, mate; no one's really going to make you read -- but for those who might want to read more about the story behind the show, I thought it might possibly be helpful to offer a few recommendations. After all, the Franklin story has been the principal or partial subject of well over a hundred books, including not only historical studies, but more than two dozen novels, many written long before Dan Simmons's, on which the series is based. When you consider that Jules Verne wrote one of the first, The Adventures of Captain Hatteras, back in 1864, you have some idea of the length of this interest; between fiction and nonfiction the list of possible readings seems almost too much for even the most voracious reader to tackle. So where to begin? Herewith, some suggestions. Until 2014, neither of Franklin's ships had been found, a circumstance which limited the scope of history but served as a spur to fiction. Those who love Tobias Menzies' portrayal of James Fitzjames have two excellent choices on either side: John Wilson's novel North With Franklin: The Lost Journals of James Fitzjames, and the late William Battersby's biography James Fitzjames: The Mystery Man of the Franklin Expedition. For viewers who want to learn more about Ciarán Hinds's Franklin, there's Andrew Lambert's biography (thorough but tedious, in my view), or the more wide-ranging and lively The Man Who Ate His Boots by Anthony Brandt. And those -- and there are many -- who've been especially drawn in by Jared Harris's darkly brilliant portrayal of Francis Crozier can turn to Michael Smith's Captain Francis Crozier: Last Man Standing. The Franklin mystery has been with us so long that the history of the search itself has been a recurring topic. My own book, Finding Franklin: The Untold Story of a 165-Year Search, is perhaps the widest overview, but there are other books that focus on specific searchers or aspects of the search, such as David C. Woodman's Unravelling the Franklin Mystery , which looks at what the long tradition of Inuit testimony, leading to the discovery of HMS "Erebus" in 2014. That discovery itself is the subject of John Geiger and Alanna Mitchell's Franklin's Lost Ship. Geiger was also the co-author, along with anthropologist Owen Beattie, of the 1987 classic Frozen in Time, detailed what was -- until the AMC series -- the most graphic and grisly of discoveries, the three bodies of Franklin sailors exhumed on Beechey Island in the 1980's. Last, and far from least, many viewers have been curious about the Inuit legends and beliefs that the series incorporates. Unfortunately, there's not yet a readily-accessible (i.e., non-specialist) introduction to the topic; the best way to learn about it remains the stories themselves. Here, I'd recommend two collections of tales: Lawrence Millman's A Kayak Full of Ghosts, which collects stories from Greenland to the central Canadian Arctic, along with Dorothy Eber's Encounters on the Passage: Inuit Meet the Explorers. Millman gives a wide range of traditional tales, while Eber collects modern versions of Inuit stories that relate to their encounters with Franklin and other explorers. Perhaps not surprisingly, Franklin's men, wandering about suffering from scurvy, exposure, and starvation, have been transformed in some traditions into hollow-faced bogeymen with which to frighten children. There are many other books -- a true "Franklinlite" can never have enough! -- but these offer a good start.